Lunching out with my sister and dear friend Beth last week during my vacation, we ate at The Cottage, an upscale restaurant in Wellesley, MA. My sister chose it because it has several gluten free items on the menu. We had lunch there last year when I was in town visiting, I had a big salad with lobster and crab and hearts of palm. Didn’t think I could get better than that. Wrong! This time I ordered a lobster sandwich and a side salad which I asked for a few slices of avocado on top. It was served in a round gluten free bun. They had to leave off the deep fried prosciutto. Chef didn’t want to pan fry it as I suggested to avoid the deep fryer which was not gf, oh well. I discovered great flavor in the lobster stuffed bun served with arugula and a touch of lemon flavored mayo. My salad was wonderful; fresh greens augmented with red onion, European cucumber and cherry tomatoes. I had them add a few slices of avocado; perfection. I totally forgot to take a picture of this plate of yumminess to remember it by: I was hungry and simply mesmerized by the flavors of both components. Sorry. Next time! Honestly, this was the best lunch combo I have eaten in many years and it was gluten free. And their fruity ice tea was tasty and quite thirst quenching. We had the best waiter; he was so helpful to me, happily checking on my gf questions with the chef. I love this place! Before that plate came out I was pleasantly surprised by the freshly baked gluten free rolls our server brought just for me. They were small and oval, a favorite in Brazil. 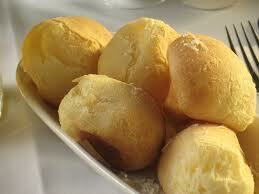 Called pao de queijo, they are naturally gluten free; made with tapioca flour, cheese, egg and milk. They are slightly chewy and moist with a flaky exterior, somewhat addictive. This was the first time I enjoyed pao de queijo although I had heard of them. I ate both rolls and longed for more…will power! My sister tried a bite and was impressed with the flavor and cheesy texture. I have already looked up a recipe for these rolls; so simple; whip it all together in blender and baking in a mini muffin pan. I must have these! My sister had twin avocado halves full of chicken salad and a lemony quinoa side salad. Gluten free and very yummy: I tasted a bite…. Beth enjoyed a juicy fat burger with a wheat roll and lots of French fries. I had to look away; I wanted both the fries and the burger. Oh well, I was pretty well set up with my delectable meal, so no worries. We three ladies shared a slice of flour-less chocolate tort served with a tiny drizzle of hot fudge sauce and a few scoops of ice cream. Did I mention the fresh whipped cream topping? Needless to say this delight did not linger on the plate more than a minute or two. We scarfed it down with our spoons and someone, not to be named, scraped the plate for the last bit of chocolate sauce! In the spirit of full disclosure, we had the same dessert last year and there was no discussion on what we should have this time around! All in all, a delightful place for eating, both regular menu for you gluten lovers and the gluten free menu which had several other tasty looking options. If you are in Wellesley or Brookline MA, where there is another Cottage; stop in for a great meal.